Ronald Schutz is a cardiologist in Portland, Oregon who was inspired by the sensori-motor homunculus – the little man inside our brain with large gracile fingers – to invent a new medical device. Like all good ideas, the power of the SonicEye ultrasound transducer lies in its simplicity. Schutz was assisting a cardiac surgeon with an echocardiograph when it struck him that it was the surgeon who should be imaging the patient’s heart and performing the surgery. The solution seemed straightforward enough: put an ultrasound probe on the end of the surgeon’s finger. That was over ten years ago. Schutz launched his company and filed for a patent that was finally granted two years ago (US Patent 8,211,026). The company, now called Sonivate, received a major boost in 2010 when it received a grant for $5 million from the US Department of Defense under their Small Business Innovation Research (SBIR) programme. The military was quick to identify the benefits of a fingertip-worn ultrasound probe, not just for point-of-care treatment in combat situations but also for its traditional healthcare activities. David Starr, CEO of Sonivate, explains that anaesthetists and other physicians who “perform needle-guided procedures appreciate SonicEye because they are able to wear the finger probe on their non-dominant finger. This allows them to image and palpate and perform the procedure with their own two hands with greater precision, stability and control than traditional ultrasound.” For radiologists, the SonicEye provides the ideal tool for performing a biopsy in patients who have been diagnosed with a breast lesion. Because of its lower profile, the probe can be placed under the physician’s glove and used in a sterile field (see photo below). A needle-guided procedure with SonicEye (provided by Sonivate). 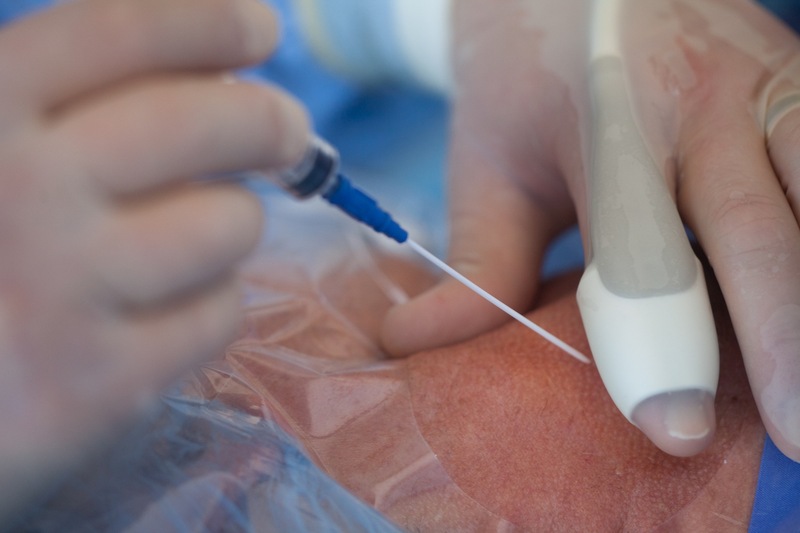 The Food and Drug Administration recently approved a 7.5 MHz linear probe with 128 elements for use with vascular access and needle-guidance procedures, while Sonivate is hard at work developing other probes for emergency medicine and OB/GYN applications. The company recently demonstrated the combination of SonicEye with Google Glass that enabled the physician – without moving his head – to see the ultrasound image in one eye while viewing the patient and the operating field with the other eye. The considerable potential of this augmented reality can only be imagined at this early stage of development. Starr and his Sonivate team are moving towards a wearable ultrasound system in which the physician will be untethered and cable-free. Now that would be pointing ultrasound in a new direction! This is an interesting development because I am very familiar with the use of ultrasound in setting nerve blocks and the use of so called “cornerstone” canulas ( http://www.pajunk.com)In my opinion fingertip ultrasound allows us to work more precise and quicker.